Industry giant Toshiba announced the development of a technology which promises a substantial cut in embedded SRAM power consumption. Ideal applications include smartphones, tablets and mp3 players -- essentially any portable device with a reliance on high-performance system memory, where the technology may be used to save significant amounts of battery power. 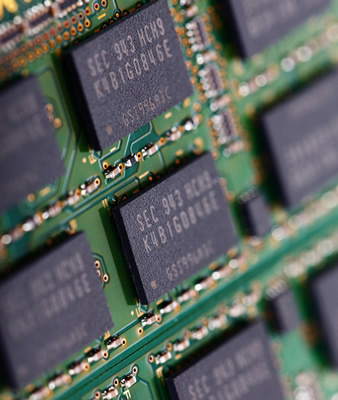 Toshiba claims embedded memory modules could have their power usage cut by 27 percent, while a device equipped with its power-saving invention is in operation. While in standby, the technology promises to shave off a whopping 85 percent of memory chip power consumption. Interestingly, the advancement doesn't rely on a SRAM redesign or a new memory type; rather, the technology employs a few circuit changes which add temperature sensitivity, predictive capabilities and dynamically adjust memory performance accordingly. Toshiba is essentially using "smarter" circuitry to lower power consumption. Toshiba's new technology applies a BLPC and DCRC. The BLPC predicts power consumption of bit lines by using replicated bit lines to monitor the frequency of the ring oscillator. It minimizes the active power of the SRAM in certain conditions by monitoring the current consumption of the SRAM rest circuits. The DCRC greatly decreases standby power in the retention circuit by periodically activating itself to update the size of the buffer of the retention driver. It's unclear exactly how much impact RAM has on power consumption in smartphones or other portable electronics; however, Engadget presumes RAM is one of the principal drains on a smartphone's battery. Due to RAM's volatile nature, even when your device is locked and the screen is off, its memory must remain constantly powered or the host device will cease to operate -- well, until a subsequent restart, at least. No doubt, this need hastens a smartphone or tablet battery's demise, even as it idles on someone's coffee table, untouched and locked. Additionally, the greater amount of RAM -- the greater amount of power is consumed. Toshiba's advancement may be one way manufacturers can compensate for growing onboard memory sizes of 2GB and beyond, alongside possible future die-shrinks and other novel memory technologies.